It's Cyber Monday so you might be expecting the items here to be discounted but they are not. Regardless, they are worthy of your consideration. The Japanese green tea assortment would delight a new or a seasoned tea drinker. 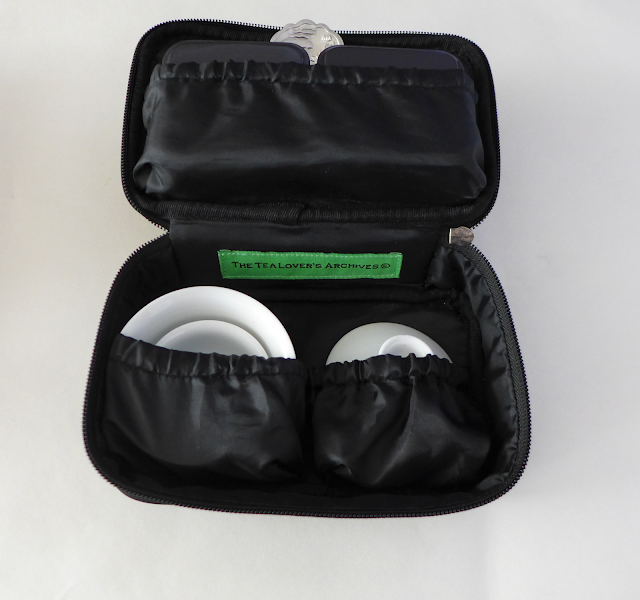 The tea case is a smart solution for traveling with tea and tea ware. Finally, the personalized tea subscription delivers your favorite tea types and flavors. 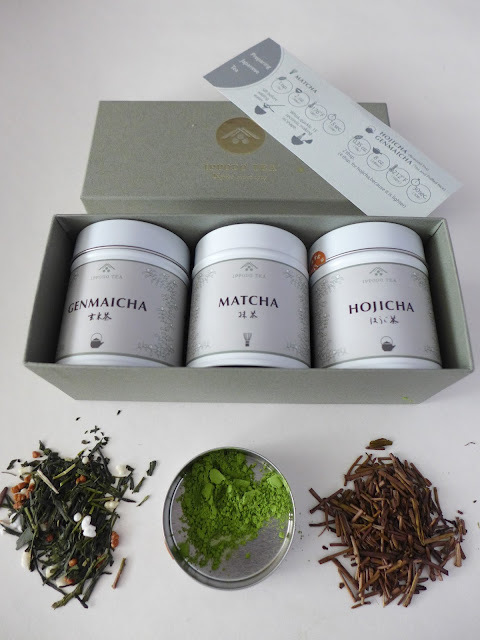 The sage green box contains three small tins of Gokujo Genmaicha (20g), Matcha Horai-no-mukashi (20g), and Kuki Hojicha (10g). There is also a guide to preparing these teas. The 3-tea assortment is branded as an "entry level set" but long-time Japanese green teas drinkers would like these teas, too. The flavor profile of each tea is fairly classic. The Genmeicha is nutty and toasted, the Hojicha is darkly sweet and roasted, and the Matcha is rich and creamy. You can purchase the gift set here. Darlene Meyers Perry describes her tea case as: "It's like my Amex, I never leave home without it!" I am tempted to do the same. I travelled with my case on an overnight trip and it was suitable for my needs. I filled the two food-safe tins with tea and stored them in the upper compartment along with the adorable tea scoop. In the lower compartment, I stashed a cup and a small gaiwan. It was a tight fit with both tins and the gaiwan so next time I will pre-measure my tea into sachets. The Take Flight "Tea" Case is available for purchase here. 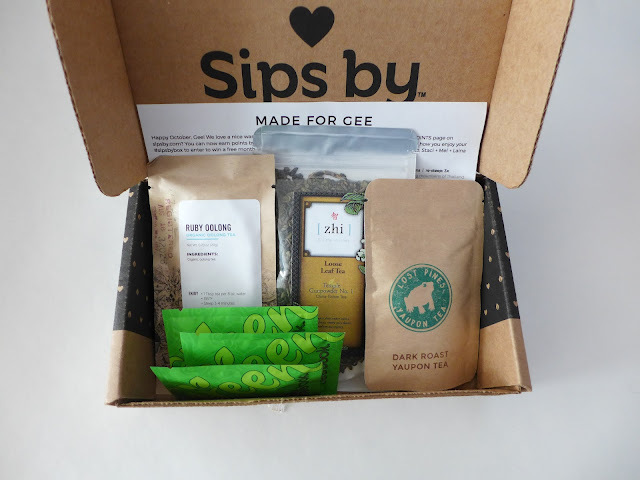 You can be fairly confident that your monthly tea box from Sips by™ will contain only teas you want to drink. I tested the service this year by ordering a box in September and in October. I was satisfied with all but one of the items included in my boxes. Sips by™ uses an algorithm to fill each subscriber's box based on a survey with questions about your tea type, flavor, and caffeine preferences, weekly tea consumption, and steeping tools. The company works with established and upcoming brands, and are constantly adding new partners. Here's a list of the eight teas I received over the course of two months: Dark Roast Yaupon Tea (Lost Pines Yaupon), Green Tip (Teabook), Ruby Oolong (Rishi), Temple Gunpowder (Zhi Tea), Silver Needle (Teabook), Clover Patch (White 2 Tea), Alishan Oolong (Terroir Tea Merchant), and Sencha (Yunomi). You can update your preferences at any time. Create your profile here. Treat yourself or a fellow tea lover to any (or all) of these products! The following were provided for review purposes: Assortment of 3 Green Teas (Ippodo Tea) and The Take Flight "Tea" Case (The Tea Lovers Archive).